Preheat oven to 400 degrees F. Melt butter in a skillet; add 2 cloves of garlic and cook for 30 seconds. Add spinach and salt; cook, covered 2-3 minutes. Drain well. Place chicken breasts between sheets of plastic wrap; pound with a meat mallet to about 8 inches in diameter. Combine Parmesan and basil; sprinkle 1 tablespoon of mixture over chicken breasts. Fold 2 sides of each breast over filling and roll up tightly. Coat rolls with remaining Parmesan mixture. Spread pastry sheets on lightly floured board. Cut each sheet in half to create six 10-x5-inch sheets. 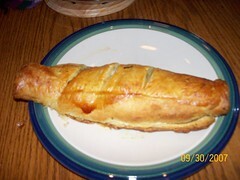 Place 1 chicken roll near the end of each sheet; fold pastry over ends and roll to enclose. Trim off any excess pastry; press edges to seal. Place seams sides down on an ungreased jelly roll pan. Puree peppers, oil, vinegar, and remaining clove garlic in blender; serve sauce with chicken. Preheat oven to 350 degrees F. Cook lasagna noodles as package directs; drain and rinse. Meanwhile, in a nonstick skillet, cook sausage and onion till brown. Drain fat. Stir in garlic and red pepper flakes. Remove from heat and set aside. In a large bowl, combine eggs, ricotta, mozzarella, Parmesan, and basil. Mix well. Spread a layer of tomato sauce in a 13 x 9 inch baking dish; top with a layer of noodles. Cover noodles with a layer of the cheese mixture; top with some sausage mixture. Cover with a layer of sauce. Repeat layering with noodles, cheese mixture, sausage mixture, and sauce. Top with final layer of noodles and sauce. Bake covered for 45 minutes. Uncover and bake about 15 minutes. Let stand for 5 minutes before serving.